Lars von Trier's stunning debut film is the story of Fisher, an exiled ex-cop who returns to his old beat to catch a serial killer with a taste for young girls. Influenced equally by Hitchcock and science fiction, von Trier (Zentropa, Breaking the Waves, The Idiots) boldly reinvents expressionist style for his own cinematic vision of a post-apocalyptic world. Shot in shades of sepia, with occasional, startling flashes of bright blue, The Element Of Crime (Forbrydelsens Element) combines dark mystery and operatic sweep to yield a pure celluloid nightmare. DVD: Widescreen 1.85:1/16x9; audio English Digital Mono; subtitles English; single sided - dual layered; 29 chapters; rated NR; 104 min. ; $39.95; street date 9/19/00. Supplements: Stig Bjorkman's Critically Acclaimed 52-minute Documentary Tranceformer: A Portrait Of Lars von Trier (1997), with Optional English Subtitles; Theatrical Trailer. About ten minutes into The Element of Crime, I turned to the friend with whom I watched the film and declared, "This is one messed-up movie!" For the record, I used a phrase other than "messed-up", but I decided to alter the actual term in case any sensitive eyes read this review. If you possess such sensibilities that my more-profane utterance might offend you, I'd recommend that you stop reading right now; Element won't be up your alley. Actually, even if you don't have any problems with vulgar language, there's a good chance Element won't be your cup of tea; it's easily one of the oddest movies I've seen in a long time. But it's oddly compelling as well - I honestly can't decide if I did or didn't like the movie, though if required to choose, I'd opt for the positive side of the coin. The film seems almost impenetrably dense with imagery and symbolism, and it's far too much for a simple boy like me to ingest on one sitting, but I did find the experience strangely fascinating; Element is one movie for which the phrase "dreamlike" really seems applicable. Or perhaps "nightmarish" might be a better term, since the dark, dank world depicted in Element isn't likely to inspire any reverie. The entire story is told from the point of view of a police detective named Fisher (Michael Elphick) who pursued a serial killer; as the movie starts, he's put under hypnosis to better recall the events. As such, this means the entire film takes on a very subjective point of view; not only are we seeing things from Fisher's angle, but we're also witnessing them from the vantage point of his subconscious, which makes for some extremely unusual imagery. It's in the visual elements that Element most succeeds, as director Lars von Trier creates a rich but unsettling vision of modern Europe. As I perused other opinions of Element, I noticed that some felt it looked like Blade Runner, but I didn't really agree; yes, both worlds show us wet, dilapidated places, but BR goes for more of a corporate-future look, with all of the neon and hovercraft. Element, on the other hand, sticks to a run-down, seedy appearance without any signs of life. Actually, I think the most apt comparisons are with David Fincher's brilliant Seven. I've seen that film multiple times, and as I watched Element, I couldn't help but think that Fincher viewed it on a number of occasions as well - the similarities in style are quite striking, and Seven also uses the concept of "getting inside" the mind of a killer to solve a crime, though not to the degree found in Element. Frankly, I prefer and will continue to prefer Seven over Element, as the former offers a much more clear narrative and greater emotional resonance; both films operate in depraved worlds but Seven makes more of a statement about human drives than does the rather ambivalent Element. One vaguely off-putting aspect of Element stems from its dialogue. Although the film was shot in English, you'll be forgiven for thinking otherwise, since most of the speech seems dubbed, and poorly-dubbed at that. That side of the audio appears weakly-integrated with the action; dialogue often sounds too loud and excessively-artificial, and it can feel disconcerting. In an odd way, however, this works well for the movie; so much of the film seems aimed at gently disturbing us as it is that this extra side of that functions bizarrely well. I don't know if the dialogue was dubbed for this effect or if it simply was a necessary part of the production - it's altogether possible many of the actors spoke poor English and needed their voices re-recorded - but it creates a weirdly-useful impression. Whatever the case may be, The Element of Crime offers one of the most unusual cinematic experiences I've witnessed for quite some time. The movie creates a strange otherworld that isn't a pleasant place to visit but it stays oddly compelling. Element isn't for everybody, but those who go for warped film noir will likely find it interesting. 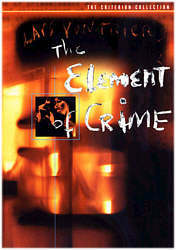 The Element of Crime appears in an aspect ratio of approximately 1.85:1 on this single-sided, double-layered DVD; the image has been enhanced for 16X9 televisions. For the most part, the film presents a terrific picture that offers only a few minor flaws. Sharpness seems consistently tight and well-defined, with just a few shots that come across as mildly soft and fuzzy; overall, the image looks clear and accurate within the bounds of the very stylized photography. Moir� effects and jagged edges are minor, and I noticed almost no artifacts from the anamorphic downconversion on my 4X3 TV. Print flaws seem infrequent, with only some occasional white speckles and a couple of scratches to mar the presentation. Since Element almost exclusively uses sepia tones, colors aren't much of a consideration, though the brownish-red of the film looks quite solid. At times we see some icy blues in neon lights or from TV screens, and these are reproduced to terrific effect. Black levels, though rendered vaguely brown by the sepia tint, seem deep and rich, and shadow detail is appropriately heavy without much excessive opacity. Actually, the latter is probably the most important aspect of this film, since the movie is so dark; without adequate shadow detail, much of the picture would have been rendered unwatchable. As it stands, some of the print flaws caused me to knock down my grade to a "B+", but it's a strong "B+"; Element looks terrific most of the time and appears much fresher than most movies from 1984. Also surprisingly positive is the monaural soundtrack of Element. Frankly, it's almost hard to believe this was a one-channel mix since it sounds so good. Though oddly dubbed, dialogue always appears crisp and clear, with no problems related to intelligibility; I found the artificial nature of the speech disconcerting but can't help but think this was intentional. (If not, it makes a happy coincidence.) Effects vary in quality from very bold and rich to simply adequate, but they never drop below that plateau and they lack any distortion or overt flaws. Music is slightly dull but generally sounds clean and appropriately bright. Since I think a mono track for a movie from 1984 puts it too far "behind the times" for a really high rating, I restricted my grade to a "B", but I nonetheless found the audio to appear very satisfying. The Element of Crime includes a few supplemental features. Most significant is a 53-minute and 55-second documentary about director von Trier called "Tranceformer: A Portrait of Lars von Trier". This 1997 program directed by Stig Bjorkman offers a fairly introspective and compelling look at von Trier's life and career through interviews with the director and others plus film clips, including some "home movies" he made as a kid. The show is mostly in Danish with English subtitles, though some movie bits and interviews are in English. Tranceformer is structured rather loosely, so though it proceeds in fairly chronological order, it doesn't give us a neat and tidy package, and we learn little about Element from it; the program focused mostly on von Trier's then-current Breaking the Waves. Nonetheless, it was an interesting introduction to the man and his work; frankly, I wish I'd watched it before I viewed Element. One negative: interview subjects are never formally identified through on-screen text. You might already know them if you're familiar with von Trier's work (I'm not), or you may figure out who they are through other comments, but it sure would have been helpful to at least list each person's name as they first appear. In addition to this program, we find the film's original theatrical trailer and some brief but fairly informative liner notes from film historian Peter Cowie. While the documentary adds a nice touch, I wish Criterion had gotten Cowie - or some other person "in the know" - to do an audio commentary about the film. Cowie's done tracks for other Criterion offerings such as Autumn Sonata and The Seventh Seal, and Element really would have benefited from a similar treatment. Even without such a commentary, The Element of Crime remains a compelling DVD. The film can be a tough ride; it's exceedingly dark and grim and clearly will not appeal to a very wide audience, especially due to its rather vague, subjective viewpoint. However, I thought it seemed strangely fascinating, and I'd guess it's likely to open up new interpretations and ideas with additional viewings. The DVD offers very solid picture and sound plus one significant supplement. Fans of gritty fare like Seven should definitely give The Element of Crime a look.